Comfortable Convertible Sauna Tent, easy up/down and light, just 35 pounds. *Comfy, Stand and Mighty Comfy Stool stool sold separately, look for combination pricing for savings. Easy up/down and light, just 35 pounds. *Comfy, Stand and Mighty Comfy Stool stool sold separately, look for combination pricing for savings. Material is natural hemp/organic cotton canvas and all organic cotton canvas, on a Basswood frame. Heats up very similar to our complete Basswood sauna. All seams are double and triple stitched, stainless marine grade snaps are used throughout to secure material to frame. Back wall is 32” wide, 50” deep and 48” wide at front entry wall and 68” tall. Assembly required, about 15 minutes. 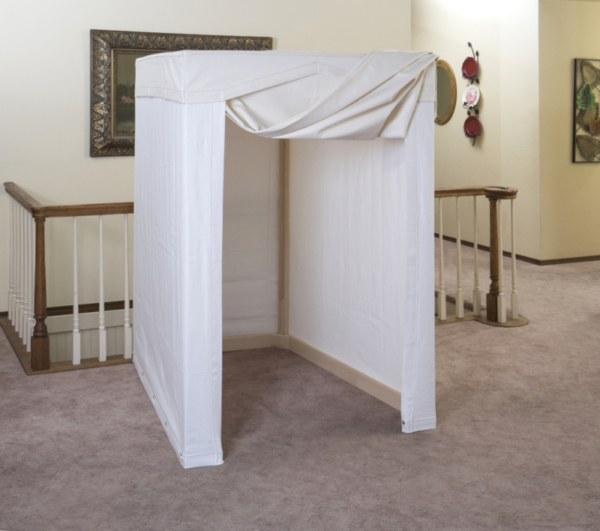 Once assembled tent can be taken down or put up in 4-5 minutes. I am an extremely health conscious individual and understand the importance of detox as well as the benefits of light therapy. And I must say, I am completely thrilled with my sauna tent. 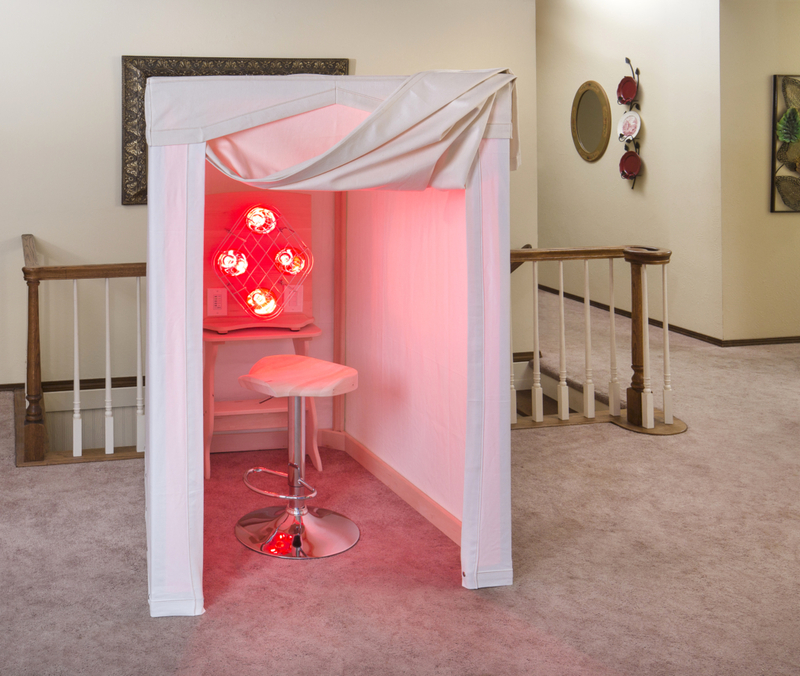 I got the whole package which included the tent, near infrared lights, stand and stool. My expectations were exceeded! I wanted something made of natural and organic materials that didn’t out-gas and were free of any toxins – – after all, isn’t that the one of the main purposes of using a sauna to begin with (to detoxify)? The quality and workmanship are excellent, not to mention the customer service. Set up was simply, straight forward and didn’t take very long. It’s the perfect size to get the job done yet doesn’t take up an unnecessary amount of space. I also like the fact that it can easily be taken down and moved if needed. Although the design is simple, every detail has been thoroughly and properly thought out. I just began using it and am working myself up slowly as it’s been a while since I have used one. I can’t wait to reap all the health benefits which are numerous! I HIGHLY recommend! I highly recommend this sauna tent, along with the Comfy, stand and stool! I started off trying to fashion my own enclosure with sheets, but never got it sealed up enough to get warm. This tent is so well constructed, and quick and easy to set up. I sweat easily in under ten minutes. I love the small footprint so it can sit in a spare bedroom, but I can also take it down for a few days if I want extra room when company is visiting. Portability is important to me, so I much prefer this to the all wood enclosures. The craftsmanship and attention to detail is superb! This will last a LONG time. We are so happy with our new sauna purchase. We got the whole enchilada – the tent, 4-lights and the rotating stool. After researching infrared saunas for health and detox, we realized that the near infrared (NIR) is the way we needed to go. We called several different NIR sauna dealers, asked lots of questions and decided on Sauna Comfort. We are very happy with this purchase and use our sauna every day. It was easy to assemble and convenient to use. Can’t say enough about this sauna – worth every penny! I love this portable sauna! I purchased the sauna tent, portable sauna, and table from Sauna Comfort mid-August 2018. I had researched infrared saunas for a number of years but did not want or have room for a large, heavy sauna. I even looked into constructing something smaller. After finding this portable NIR sauna from Sauna Comfort online, I decided it would be better to buy one – and am so glad I did. It is SO much better than I ever expected. Rich was responsive and helpful in anticipating and answering my questions. Shipping was fast and it arrived well-packaged. I love the design, the craftsmanship and finish work, and the way the pieces fit together. The unfinished basswood frame has nicely rounded edges. It is lightweight, easily assembled (with a T-15 screwdriver bit! ), and easy to take down and move if you need the space. The canvas cover is substantial, constructed well, snaps easily onto the frame, and the design is such that the front cover tucks in nicely to seal out drafts. The 4-light sauna unit has a 5-button timer (5, 10, 15, 30 minutes and off) and independent lamp switches. It sets easily on the table, which also has nicely rounded edges. Dr. Wilson’s book is a plus for sauna therapy reference. I was mainly interested in help for dry skin (and am very happy with the results so far), but it’s clearly beneficial for so much more. The lamps have a nice penetrating heat, which is surprisingly comfortable and almost meditative (if that makes sense). I only wish I had made the decision sooner. Many thanks for making these great sauna components available – I could not be happier! I first started out with the Sauna Comfy, Portable Sauna in Dec. 2017, which I used in a small bathroom. In Dec. 2018 I purchased the sauna tent and couldn’t be happier. Although the Portable Sauna worked good in my small bathroom, the tent made all the difference. 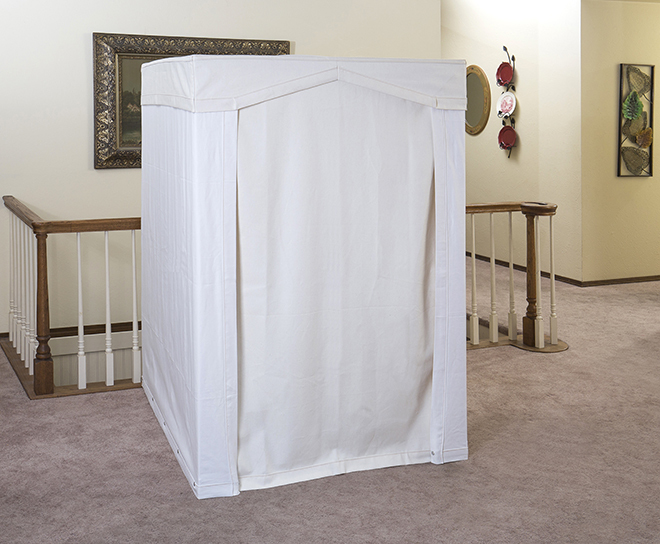 I had a thyroidectomy 20 years ago and it was very hard for me to sweat, but since getting the sauna, and now the tent to go along with it, I sweat like I never sweated before. This company couldn’t be more reliable. Rich’s work is impeccable. Not only is the Sauna Comfy made of high quality wood and infrared lamps, the tent is unbelievably high quality. It looks like it will last forever. You cannot go wrong ordering from this company. Rich answered all my questions (and believe me there were many along the way) with detail and professionalism. If you’re on the fence ordering this sauna and tent, it is worth every penny and you will not regret it. My husband, who was reluctant for me to order the tent, agreed with me of the high quality of workmanship Rich has, and he loves the tent also. He said he’s glad I ordered the tent now. Thanks so much Rich for your high quality products that make us all the more healthy!!! We love it and feel so much better since doing the sauna!